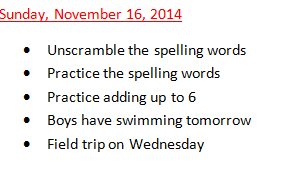 Spelling: Practice writing and spelling this week’s words. (for, on, are, back, black, snack, picnic, fun. 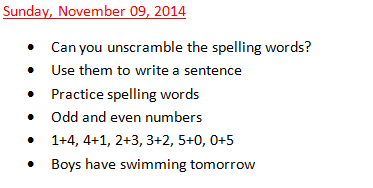 Unscramble this week’s spelling words. Handwriting: Fill in one page of your handwriting booklet and bring it to school tomorrow to show your teacher. Math: Practice using tally marks, writing before and after numbers and counting the dots. Also continue to practice writing your numbers. Ask your parents to help you find some pictures of you and your family out in the community. Bring them to school and share them with your class. Also please remember that the girls will have swimming tomorrow. practice the sight words; blue/big/can ( remember that sight words are words that the children can recognize instantly and they do not have to be able to spell them. Please send a healthy lunch with your child every day. Children will not be allowed to eat chocolate or chips that are in their lunch boxes. If you have not returned the videotaping and photography permission form please do so as soon as possible. Teachers cannot post pictures of your child on the weebly site unless you have returned this form. If you do not have a for just send me an email and I will send one home with your child.